Fairies, or nature elementals, are everywhere in the natural world. There are tree spirits called dryads, air sprites, undines of the water elements, gnomes of the earth…fae of many different varieties. 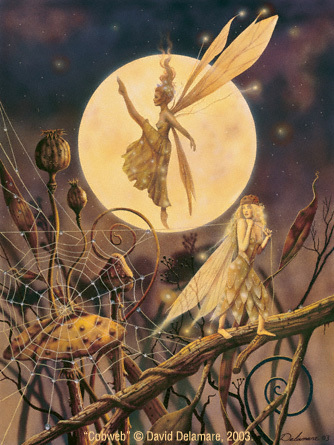 Some fairies are reported to be helpful, if a bit fun loving, and others are not really good sorts for most of us to have hanging around. It’s probably a good idea not to invite the fae indoors unless you have certain ones in mind and you have a positive relationship with them. Brownies are reported to be great house elementals to have indoors, but when in doubt about whether to invite an elemental indoors, don’t. If you like keeping a garden, as I do, then encouraging the fairies to live in your garden is a great idea. They will lend their energy to the plants and create an amazing energy for you to enjoy all year round. You can do certain things to encourage fairies to live on your property, but most important to laying out the fairy welcome mat is your intention! You can make up a simple rhyme and walk around the yard repeating your charm over and over. I like to say a little fairy blessing whenever I plant something here at Angels Grove. Even apartment dwellers can usually find a window sill or balcony on which to create a fairy garden. So don’t let lack of space stop you! There are certain trees and flowers that are favored by the fae. Even planting a few of them will encourage the fairies to stay. Probably the tree that fairies are most crazy about is the oak. Some old oaks have hundreds of fairies living in them. Other trees sacred to fairies are the hawthorn, ash and elder. Holly protects your home and willows are sacred to the goddess. Fruit trees and especially apple trees are preferred. Roses are high on the list as well. I am a passionate rose grower and I feel the fairies’ energy very strongly each April when the roses start to bloom. Fox gloves are a traditional fairy flower, as are violets, primroses and lilacs. I planted a lilac bush a few years back and it just sat there for the longest time. Lilacs aren’t supposed to grow where I live in Texas so I knew there was a chance it wouldn’t do well. I watched and waited hoping that someday I would get at least one fragrant bloom, and this year it happened! I had been going through a very rough time emotionally and was talking to my son outside when I suddenly caught sight of a small purple bloom on the bush. I rushed over to take in its delicious fragrance! I knew that bloom was a sign from the fairies that things were going to get better in my life. I had been faithful to one of their sacred plants and they were telling me that they were looking out for me. Some herbs worth mentioning for a fairy garden are rosemary and thyme. It is said that fairies like to use rosemary bushes to hide in. Thyme is intoxicating for fairies. Plant it liberally around your garden. There is even a variety of thyme with tiny leaves called Elfin Thyme. In fact, any plant with “fairy”, “elfin” or “sprite” in the name is worth considering for your garden. When you harvest plants from your garden be sure to ask permission from the plant or its elemental beforehand, and then be sure to give thanks. Aine is a great goddess to get to know if you are planting a magickal garden. Gaia or any other earth or mother goddess would be excellent as well. Need I say it? But don’t use a bunch of chemicals on your plants – especially poisons. 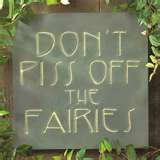 That will indeed piss the fairies off! It is also a good idea to leave at least a small (or large) patch of your yard a little bit wild looking. Don’t be too obsessive about the weeds…not usually a problem for me! A fairy garden is a relaxed and joyous garden. Cottage gardens are ideal. Versailles would probably not be the fairy residence of choice. With the popularity of fairies at the present time, there is a wide selection of fairy garden flags and statues. Placing a few fairies in the yard lets the fairies know that you recognize their presence. Whether or not they actually look like the beings portrayed by the garden artwork really isn’t important. They will read your intention and feel welcomed. You might even find some tiny fairies to place in your apartment window boxes. Most pagans interact with elementals on some level due to the fact that paganism is usually Earth centered. Growing your own herbs and flowers for spells is so much better than buying them from an apothecary or on the internet. Gardens usually fail because the gardener fails to learn what they need to know about the needs of the plants they are trying to grow. Interested in learning more? Ellen Dugan has written some great books on the topic of magickal gardening. Check out Garden Witchery and Garden Witch’s Herbal. Ellen is one of my favorite authors and writes a great blog! So do your homework, buy some flowers or seeds, and dig your hands into that beautiful soil around your house. And don’t forget to invite the fairies to help you! Beautiful post! My fiance and I are buying our first house (should be closing within just a couple weeks) and I am working on planning my flower, herb and vegetable gardens. A spot for the fairies is definitely in the works, as well, since it is a promise I made many, many years ago, as part of a mutual agreement. Thank you for the information here, it is so perfectly in tune with what I’m planning to do!